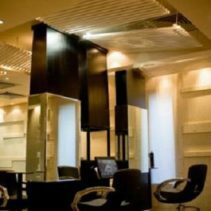 I want to share with you my awful experience in the salon Chez Richard (17 Off Abdel Moneim Riad St., Aswan Sq.، MOHANDESEEN، الجيزة). When you pay for manicure 250 LE 50 for gel removal you expect that you will receive a high quality service and professional treatment. 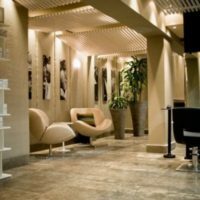 First of all I need to mention that it was my first experience with the salon for manicure – gel polish removal, manicure and polish with gel. What she did is a very heavy layers of golden polish on my nails that became bubbles in some parts of nails, but I was already late and it was a holiday (forgot to mention it was st. Valentine’s Day) and my husband was planning an outing so I didn’t want to make a story and spoil our mood. But before my husband took me from the salon we showed my nails to the receptionist and we said that we are not satisfied with the girl work. He said sure come tomorrow and we will re do it for you, I said that I want another girl if possible, he told us sure no problem (mafish mushkela). I couldn’t make it next day, because I got busy, but the day after (on 16th of February) my husband brought me back to the salon and the reception send me to other girl. First she started to remove the polish not with a special removal, she just started to file off the polish with out any preparation. It is very wrong because the nail under the pressure of polish is sticking to it and there is a big risk that she can simple take off the layer of my natural nail with the polish. I warned here about it and even took off my hand, need to mention that she didn’t speak english and the girl visitor translated this my warning to the manicure girl. She said ok and wrapped my all nails into foil with the special removal finally. I thought I am safe. But here came the girl who made for me manicure the first time and simple stood over my head asking me why I am redoing my nails. what I didn’t like and do I want something else and bla-bla-bla. Would you feel comfortable in such situation? I don’t think so, my blood was already boiling, but I politely answered, that I didn’t like the quality of the work that she did and I want to redo my nails. She didn’t go away, she was still there having a chat with the girl who supposed to make my manicure. Finally she took off the the foil and ATTENTION started to remove polish with her own nails??? Where in the world professional specialists do this??? There should be a special tool for removal the old polish after the liquid removal. I again took off my hand and showed her that she can damage my nail, she said ok ok and she took the tool, but my first nail was broken, I just freezed, I couldn’t believe how the hell she did this… And the way she was grabbing my hand and taking off the polish was with so much hate and force that I run to the toilet and called my husband to take me away from this horrible place… Seriously I have no words still, she broke all ALL my nails for the second, and while doing this she was still talking with her college who was standing over my head. When my husband came to the salon I took all my stuff and told them I don’t want anything anymore, the manicure girls were surprised. I showed my nails to my husband and he called the manager, he didn’t say anything accept they are sorry and proposed to walk out of the salon and talk on the street, very professional, right? Then they called a girl who was making my manicure and my husband asked her to explain how the f*ck it happened that all my nails are broken? And she said sorry, she will try to make it beautiful, but this gel polish can’t be removed by other way, when I heard this I started to be even more angry, I was doing manicure in many places in the world, but nowhere nowhere I had such experience, especially in a premium salon like this, or it is just seems to be premium, really the manicure girls there they don’t know how to do anything, I have no doubts that they even didn’t study this and they don’t have any certificates proving their qualification. So should they still be working there and spoiling nails of other customers? I don’t think so. And the final proposition of the manager was that they can put fake nails on glue on my nails… I have no words… Seriously, to break all my natural nails and propose to me fake ones. This is how they treat their clients. I told them no one of them will touch my hands again, we were walking out of the salon and my husband promised them a big advertisement in the web about their service and only then when we were at the door they were running with “we can refund you, wait, we are sorry”. We didn’t stop and my husband told them only now you are talking about refund when we are leaving, you can keep the money, but you will loose your reputation. So I am asking all of you who ever will think about making a manicure there DON’T! And share this information among all your friends and all the people about whom you care.